All-Star pitchers Corey Kluber (left) and Trevor Bauer (right) figure to be key components of the Cleveland Indians' starting rotation during the 2019 season. 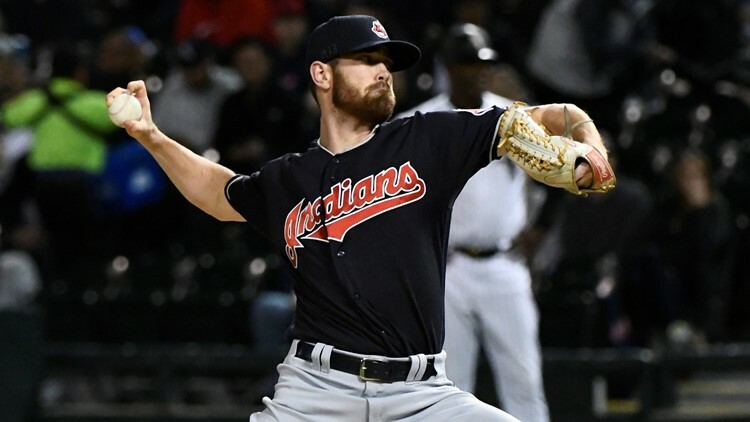 Here is a look at what the Cleveland Indians’ starting rotation could be heading into the 2019 season after pitchers and catchers reported for Spring Training Tuesday. CLEVELAND — The Cleveland Indians’ preparations for the 2019 regular season are underway. Pitchers and catchers reported to Goodyear Ballpark in Goodyear, Arizona, on Tuesday, and after undergoing their physicals with the team medical staff Wednesday, they will go through their first official workout together in Spring Training Thursday. The rest of the team will report to Spring Training on Saturday. Here is a projection as to what the Indians’ starting rotation will look like when the 2019 regular season gets underway against an American League Central Division foe, the Minnesota Twins, at Target Field in Minneapolis on March 28. Cleveland Indians starting pitcher Corey Kluber delivers a throw to home plate against the Chicago White Sox at Guaranteed Rate Field in Chicago, Illinois on September 24, 2018. After much debate about Kluber and Trevor Bauer being on the trade block for the last three months, no deal has been made and reports say a move is not likely to come following other payroll-reducing measures with trades of catcher Yan Gomes, DH Edwin Encarnacion and infielders Yandy Diaz and Yonder Alonso, as well as the free-agent departures of outfielders Michael Brantley and Lonnie Chisenhall and pitchers Andrew Miller and Cody Allen. 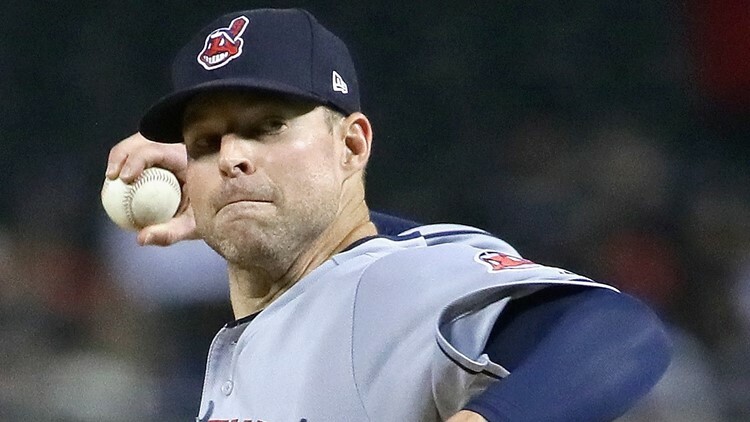 In his 33 starts last season, Kluber (20-7) registered 222 strikeouts against just 34 walks, 179 hits and 69 earned runs allowed over 215.0 innings of work while anchoring a pitching staff that led the way to the Indians’ third consecutive AL Central Division Championship. Opposing batters hit just .223 against Kluber during the 2018 season. An AL All-Star for the third consecutive season, Kluber posted an 8-2 record in 13 starts following the 2018 Mid-Summer Classic. Over 81.1 innings pitched, Kluber struck out 90 batters and walked only 17 while cutting down on his home runs allowed. Kluber is 96-55 with a 3.09 earned run average in 201 games over eight seasons with the Indians. Cleveland Indians starter Carlos Carrasco delivers a pitch in the first inning against the Houston Astros during Game 2 of the American League Division Series at Minute Maid Park in Houston, Texas on October 6, 2018. During the 2018 regular season, Carrasco posted a 17-10 record with a 3.38 ERA in 32 appearances, including 30 starts, for the Indians. Over 192.0 innings of work, Carrasco surrendered 173 hits, 78 runs, 72 of which were earned, and 43 walks but registered 231 strikeouts. 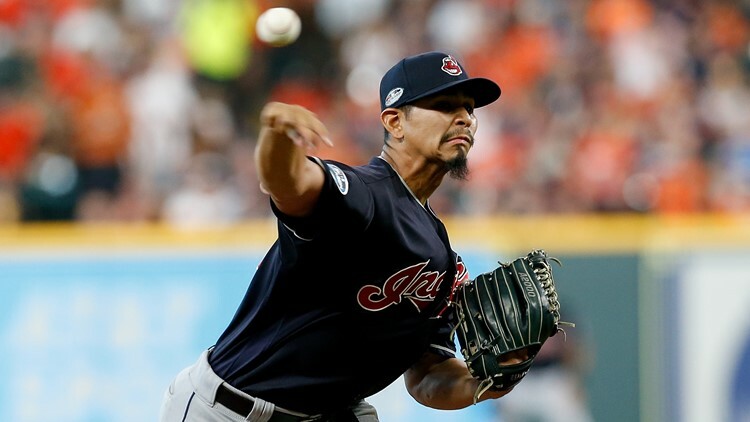 One of four Indians pitchers with 200 strikeouts in 2018, Carrasco is 79-62 with a 3.71 ERA in 207 games, including 171 starts, for the Indians. Over 1,094.1 innings of work, Carrasco has registered 1,127 strikeouts against 278 walks allowed while limiting opponents to a .246 batting average. Cleveland Indians starting pitcher Trevor Bauer delivers in the sixth inning during Game 3 of the American League Division Series against the Houston Astros at Progressive Field in Cleveland, Ohio on October 8, 2018. Considered by some to be a potential Cy Young Award candidate for his efforts through the first four months of the season, Bauer set new career highs in several statistical categories despite missing five weeks because of a broken bone in his right leg suffered against the Chicago White Sox on August 11. Bauer registered 221 strikeouts against 134 hits, 43 earned runs and 57 walks allowed in 175.1 innings of work over his 28 appearances. Bauer compiled a 12-6 record and 2.21 ERA while opposing hitters batted just .208 against him in 2018. Bauer set a single-season high for strikeouts and personal lows for ERA, hits, runs and earned runs allowed and walks in a year with at least 26 starts. Bauer has been a double-digit winner in each of the last four seasons, totaling 52 wins since 2015. 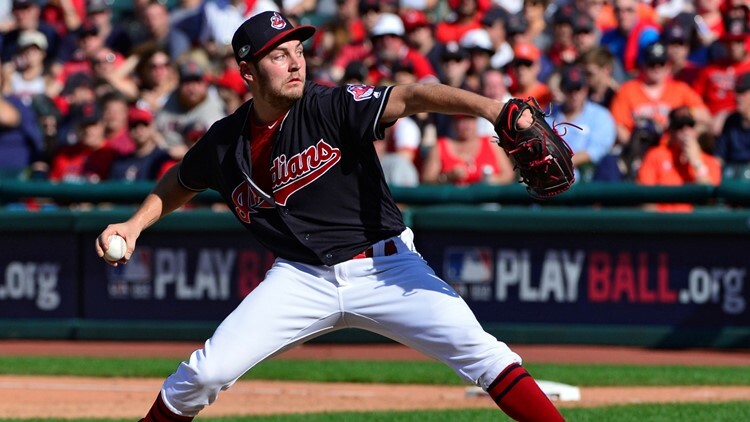 Additionally, Bauer has struck out at least 143 batters in each of the last five years, with his single-season career-best, 221, coming in 28 appearances, including 27 starts, for the Indians last season. 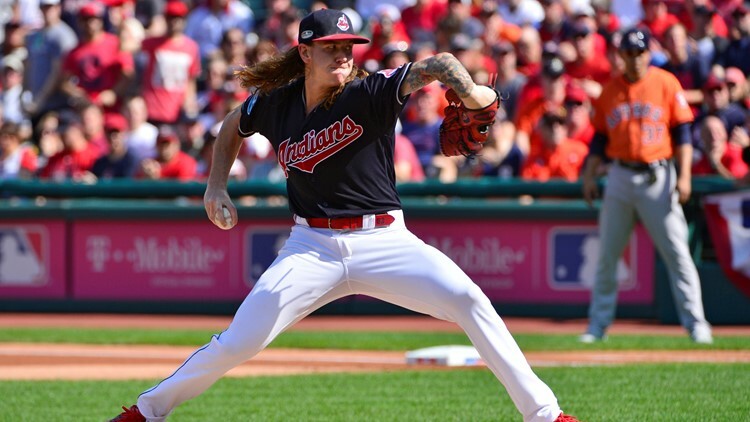 Cleveland Indians starting pitcher Mike Clevinger delivers in the first inning during Game 3 of the American League Division Series at Progressive Field in Cleveland, Ohio on October 8, 2018. During the 2018 season, Clevinger emerged as a permanent fixture in the starting rotation, logging 200.0 innings of work in his 32 appearances. Clevinger allowed 164 hits, 67 earned runs and 67 walks while striking out 207 hitters on his way to a 13-8 record. Clevinger made MLB history in his final home start of the season when he became the fourth Indians pitcher with 200 strikeouts in the same season. No other team ever has had four pitchers with 200 or more strikeouts in a single season. Cleveland Indians starting pitcher Shane Bieber (57) delivers against the Chicago White Sox during the first inning at Guaranteed Rate Field in Chicago on September 26, 2018. Bieber made his Major League debut at the Twins on May 31, 2018, and after giving up eight hits and four runs, all earned, in 5.2 innings of work against one of Cleveland’s Central Division rivals, he became a reliable contributor. Bieber finished the 2018 season with an 11-5 record in 20 appearances, including 19 starts, for the Indians. Over 114.2 innings of work, Bieber struck out 118 hitters against 23 walks allowed. He surrendered 60 runs, 58 of which were earned, and 130 hits in his first big-league season. Although Bieber had a successful rookie season, he is not resting on the laurels of past accomplishments, not especially with the goal remaining to contend for a World Series Championship in 2019 after coming up short in each of the last three years.